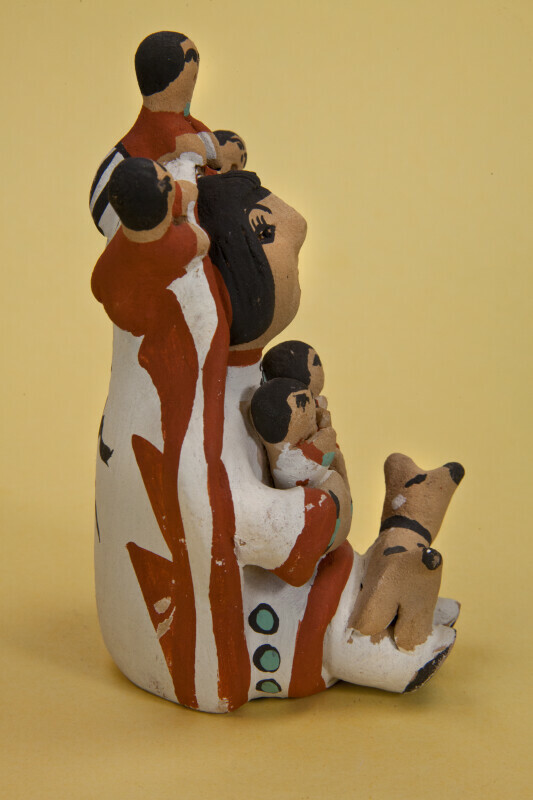 New Mexican ceramic storyteller figurine with a woman, five children, and a dog. Storytellers (a man or woman with an open mouth, who is surrounded by many children or animals) were first introduced by the Cochiti Pueblo Indians in New Mexico. Helen Cordero is credited with creating the first storyteller sculpture (in 1964) in honor of her grandfather, a tribal storyteller. Painted on bottom of pottery: "E. Cajero. Bird Image. Jemkz ’92 - Sun Bird.” The figure is 5 inches (13 cm) tall.